Making A Wish Come True! Much has happened with Bethany since my last update. Her liver numbers are currently stable. She has completed her freshman year of high school with an A/B average. She has been swimming just about everyday in June. She was able to volunteer for our church’s VBS. And, the four of us will be leaving in just a few days for Bethany’s Make-A-Wish! We give God thanksgiving and praise! Even during many rough days and nights, He continues to sustain us. Thank you too for sustaining our family through your prayers and notes of encouragement. Bethany’s Make-A-Wish will carry us out to sea on the Disney Dream. 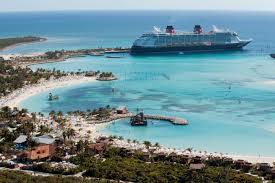 We will visit Nassau and Disney’s Castaway Cay. At Nassau, Bethany will get to swim with the Dolphins, a desire of hers for the past eight years. All of us are excited and looking forward to this opportunity to relax and celebrate this time in Bethany’s life. So, be on the lookout for Wish Pics once we return home. We love and appreciate each one of you. You have walked this long hard road with us. Thank you! 1. Please pray for good health (for all, especially Bethany), safe travel, and cool, beautiful weather! 2. Please pray for my mother, Kay Kendrick. She had a pacemaker placed in yesterday. I am with her now. My brother will be traveling in tonight. Please pray for no complications, a quick recovery, and that this pacemaker will truly help her to feel better. 3. Please pray for Bethany’s CMV and EBV numbers. These are the two viruses which caused her to have lymphoma last year. Since placing and removing her biliary tubes, these two viruses have been active in her body. We are still trying to adjust her medication to compensate for these viruses, but to date we have not gotten them completely under control. 4. Please pray for a dear family friend of ours who was seriously hurt last night. His name is Darius. He was hit by a golf cart in our neighborhood last night while riding his bicycle. He has a compound fracture in his arm, and had to be taken to Children’s hospital.